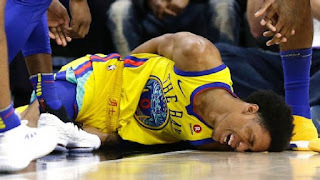 SACRAMENTO, Calif. -- Golden State Warriors second-year guard Patrick McCaw was taken off the court on a stretcher after being undercut inadvertently by Sacramento Kings forward Vince Carter. McCaw took an awkward, hard spill as a result of the contact and landed on what appeared to be his backside. The Warriors announced late Saturday that a chest X-ray and CT scan came back clear and that McCaw will undergo an MRI. "I just hope he's OK,'' Carter said. "I play this game because I love it and enjoy it, not to see young guys get hurt. He has a bright future. I just hate to see it." McCaw drove the baseline and went down hard after being hit in the lower body by Carter with 41.8 seconds left in the third quarter of Golden State's 112-96 victory. McCaw stayed on the floor for about 10 minutes in pain with his body contorted sideways. Both teams were in shock, and Golden 1 Center was silent as McCaw lay on the court. Teammate Nick Young had a difficult time looking in the direction of McCaw while he was being tended to. "It was really scary," Golden State coach Steve Kerr said after the game. "He was in a lot of pain, laying on his back. ... It's scary stuff." McCaw was placed on a stretcher and wheeled away with his neck stabilized. He was taken to UC Davis Medical Center in an ambulance for further evaluation. "It's terrifying. That's all we're thinking about," said Kerr, who did not want to talk about anything from the game itself. "We just hope he's OK."
McCaw was given a standing ovation, and both teams huddled together in unity for prayer. "Said a prayer for him, you know, because he didn't want to be there, you know what I mean? So just a bunch of good guys doing the right thing," Carter said of the huddle. Soon after, Warriors players David West, Shaun Livingston and JaVale McGee went to the locker room to calm their emotions. In discussing the play, Carter, who was given a flagrant foul 1, said he only remembered McCaw's "foot hitting the side of my leg." He said his involvement in the play troubled him despite it being "a freak accident." "You can tell me whatever -- it was an accident, whatever. I just don't like to see it," Carter said. Kerr initially expressed anger toward Carter for his role in McCaw's fall, but as the severity of the situation became more apparent, Kerr came onto the court and consoled a visibly shaken Carter as they looked on at McCaw. "I didn't see a replay," Kerr said. "Vince felt horrible. I was out there next to [Carter]." Following the game, Carter walked over to Kerr and the Warriors' coaching staff to further apologize. Warriors stars Kevin Durant and Draymond Green both said they believed it was an accident. "I know Vince's spirit and his heart. I don't believe it was intentional at all," Durant said. "It looked like he was just caught in the middle of the play and wanted to move out of the way, but Pat was coming so fast. It was just an unfortunate play. Nobody in our locker room thinks Vince did that on purpose." 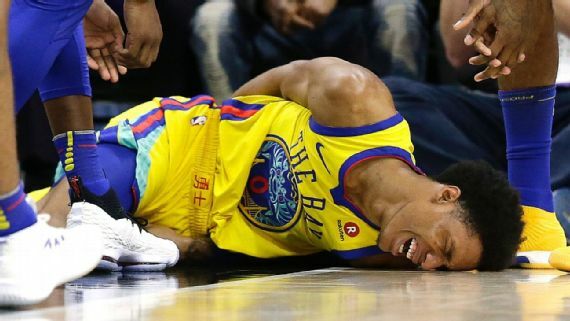 0 Response to "Hard fall forces Warriors' Patrick McCaw to leave game on stretcher"